SOLD SOLD SOLD ! CONGRATULATIONS TO THE HAPPY NEW OWNERS --- SLIP AWAY TO SLIGO and find your COZY CABIN HIDEAWAY on these 110+ ACRES with something for everyone! This nice WOODED ACREAGE in northern Dent County is laced with TRAILS and dotted with SPRINGS and hidden CLEARINGS along the SPRING BRANCHES. This pretty HOBBY FARM has a LUSCIOUS BOTTOM FIELD that’ll keep your hobby herd happy, so BRING THE HORSES (or a few cattle or goats?) THINK ABOUT PIE ….many various apple, pear, cherry trees and blooming perennials! DROP A LINE in the LITTLE LAKE and relax into the sounds of nature. Rustic style CUTE CABIN offers one bedroom on the main level, and loft space for possible additional sleeping areas. The wide FRONT PORCH (or WILDLIFE OBSERVATION STATION as I like to think of it) serves as your front row seat to glorious sunsets! There’s a nice CONCRETE STORM SHELTER for those bad hair days. The handy POLE BARN has a lean-to, and is rigged with solar panel. Located just off Hwy 19 between STEELVILLE and SALEM, you’ll FIND YOURSELF right smack dab in the center of the region’s RECREATIONAL PLAYGROUND of FISHING and FLOATING STREAMS (Meramec & Current) and just down the road from the 13,000+ acres of INDIAN TRAILS CONSERVATION AREA and many more THOUSANDS OF ACRES of MARK TWAIN NAT’L FOREST. SHOWN BY APPOINTMENT TO PRE-APPROVED BUYERS. You're gonna LOVE what you see here! SOLD SOLD SOLD!...........LOVE THE LAKE LIFE? Then, this TURN-KEY LAKE RETREAT is calling you home! Enjoy THE greatest escape or permanent dwelling (or consider the possibility for FAMILY COMPOUND / CHURCH CAMP / WEEKEND RENTAL?) and MAKE MAGICAL MEMORIES on these 94 ACRES of MATURE TIMBER with TWO HOMES privately situated next to the stunning little SPRING-FED LAKE (approx. 3 acres – and well stocked of course)! 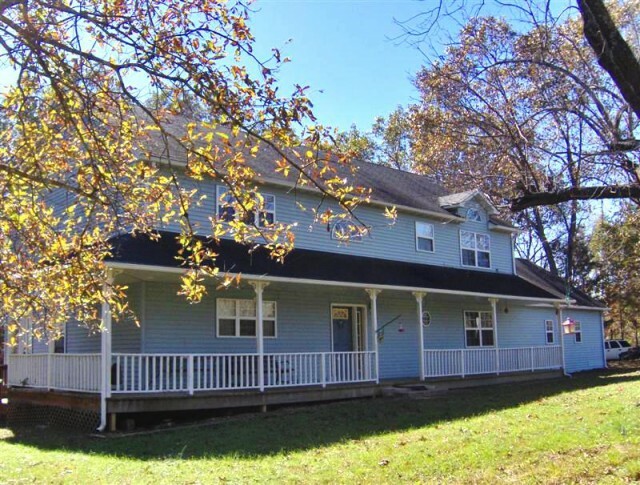 This beautiful acreage has an EXTENSIVE TRAIL SYSTEM for walking or ATV fun, and PAVED COUNTY ROAD frontage just an hour’s drive from south St. Louis County (Google sez 67 miles). These COMFORTABLE and ATTRACTIVELY FURNISHED homes are privately situated LAKESIDE…you won’t be seeing anyone unless you invite them along! Bring the in-laws and the outlaws – there’s plenty of room for guests or EXTENDED FAMILY in the all-electric 3BR/2BA doublewide -- and save the DELUXE RUSTIC CABIN for yourself! (It’s so rustic it has a JET TUB and inside plumbing!) FAMILY FUN – HERMIT RETREAT - HUNT - HIKE – FISH – FLOAT - ATV – RUSTICATE - RUMINATE – COUNT THE STARS AND FIREFLIES AT NIGHT. Experience PEACE ON EARTH just a couple of miles west of Bismarck (gas, diners, grocery, Dollar Gen) near all the natural jewels this beautiful region of Missouri is famous for: Hughes Mtn, Buford Mtn, St. Joe State Park, Johnson’s Shut-Ins, Elephant Rocks, Mark Twain National Forest, Black River. SHOWN BY APPOINTMENT TO PRE-APPROVED BUYERS ONLY. AN AGENT WILL ACCOMPANY ALL SHOWINGS. You’re gonna like what you see here! SOLD SOLD SOLD! --- Lovely little LAKE graces this gently rolling, wooded acreage in northern Washington County, Missouri. Privately situated just one hour south of St. Louis County, this hidden gem may be the hideaway or home site you’ve been looking for! 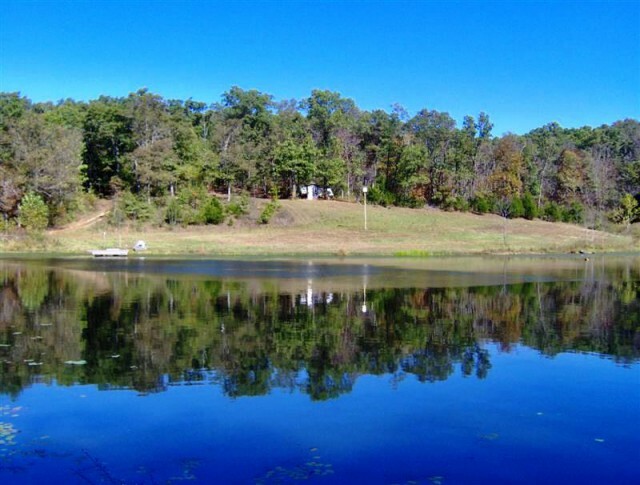 This surveyed acreage has a cleared home site overlooking the pretty stocked lake. Great spot for FDIC (Fun Down in the Country), hunting, fishing, camping – and there IS a nice little outhouse. There’s also a floating dock from which to catch “the big one!” Private road entry, locked gate…property cannot be seen from the road. SOLD SOLD SOLD! ......HUNT, HIKE, and HAVE AT IT IN COOK STATION! SURVEYED LAND in SW CRAWFORD COUNTY MISSOURI has tremendous views in every direction! 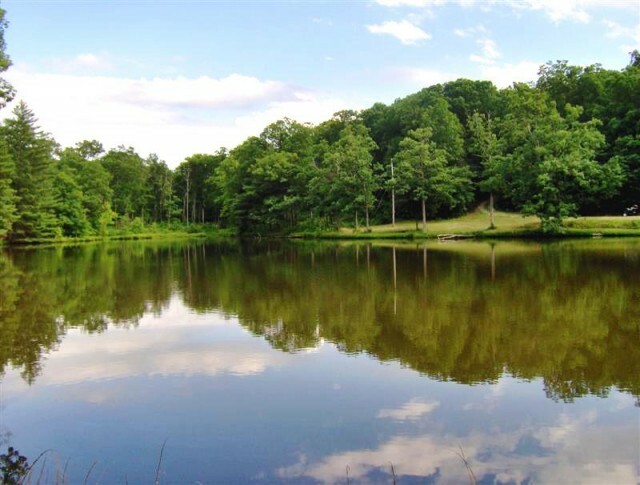 Awesome HOME SITES and possible LAKE SITES on these 61+ ACRES of gently rolling terrain. DIVERSE LAND is a mix of fields and woods. There’s plenty of good grass to start your hobby farm and graze your herd of horses or cattle. PERIMETER and CROSS-FENCED. Stock pond. Electric service line runs across the south end of the parcel. PAVED ROAD FRONTAGE makes it accessible, approximately 15 miles north of the amenities at Dent County Seat of SALEM, and about ½ hour south and west of Crawford County Seat of STEELVILLE, the Float Trip Capital and gateway to endless recreational activities that the area is famous for. ..Meramec River fishing and floating, Mark Twain National Forest lands, Current River fishing and floating ….. Seller has recorded restrictive covenants to protect the quality of the land. SOLD SOLD SOLD! 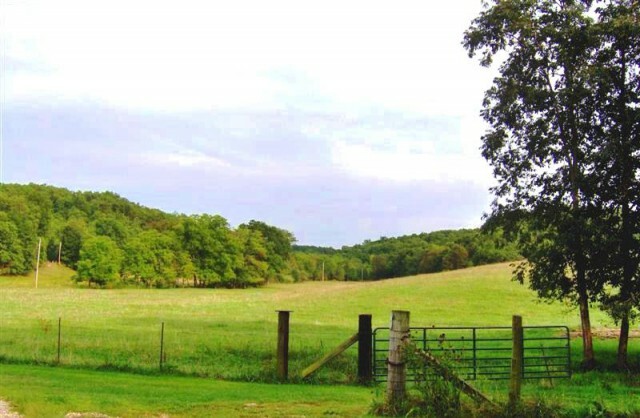 118-ACRE MISSOURI OZARKS HOBBY FARM -- BUCKSNORT RANCH This diverse LAND HAS IT ALL in an oh-so SCENIC VALLEY setting! Ready buyers, you must consider this parcel of HORSE-friendly CATTLE-friendly (goats & chickens y'all come too!) 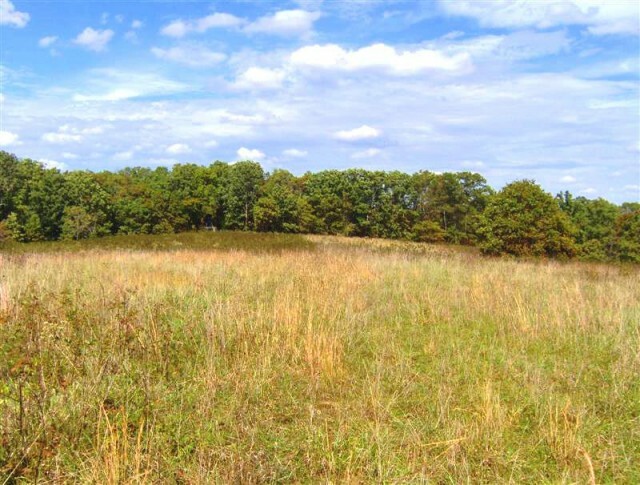 LAND in NW Reynolds County that adjoins so MANY THOUSANDS OF ACRES of the beautiful MARK TWAIN NATIONAL FOREST. Here, you'll be able to take the road less travelled and explore the jewel of our southern Missouri region and all the abundant wildlife, natural beauty and solitude that it has to offer -- there for your use and enjoyment, and laced with gravel county roads and Forest Service roads to get you "out there." The lush, well managed X-FENCED PASTURES of the BS Ranch are well watered with two STOCK PONDS and a couple SPRINGS -- and perennial BUCKSNORT FORK that meanders north through the bottom fields to feed HUZZAH CREEK. It's still running cool and clear on Labor Day! There are several useful OUTBUILDINGS and SHEDS that have stood the test of time, still strong and square, and a nice newer HAY BARN with sorting pens, chutes, and head catcher for working your herd. 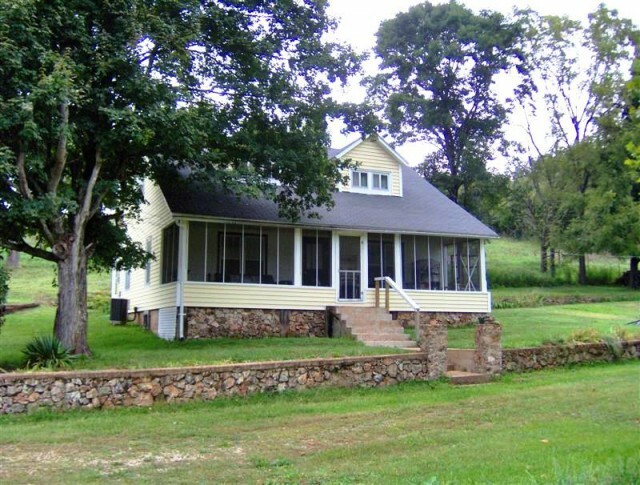 This home sweet homestead and all-around good clean place has COUNTY ROAD FRONTAGE, about 1/2 hour from the Dent County Seat of Salem, Missouri. The well-loved 2 BEDROOM HOME was built in 1970 and features VINYL SIDING and a METAL ROOF, nice hard wood HICKORY FLOORING throughout the main level, a FULL WALK-OUT BASEMENT with another sleeping room and full bath, storage and laundry. The SPACIOUS ATTACHED GARAGE (with a view!) has plenty of work space. Stay cozy warm for low heating cost with WOOD and ELECTRIC FURNACES (yep, two furnaces) in the basement and the OUTDOOR WOOD/WATER STOVE -- no sense catching a CHILL til you turn on the A/C! Just imagine resting on the shady front porch of this TIDY HOME in the sweet evening time, gazing down the beautiful valley! Come on out to this gorgeous countryside to enjoy the BRIGHT LIGHTS of Reynolds County -- stars and fireflies. PEACE IN THE VALLEY = PEACE OF MIND! Please call for more information about this fine offering! MOTIVATED SELLER requests QUALIFIED BUYERS with a 24-HR NOTICE, please. An agent must accompany all showings. SOLD SOLD SOLD! GREAT VALUE HERE -- MOTIVATED SELLER SAYS SELL IT! There’s a great collection of METAL OUTBUILDINGS on this place – and GREAT VIEWS across the neighboring ridges -- you’ll be at fire tower elevation in very SW Washington County where this 1988 model 3BR 2BA doublewide home in good shape sits on a FULL WALKOUT BASEMENT! Only 5 homes on this DEAD-END ROAD, so little traffic to deal with if your dog(s) would choose to sleep in the road, like a country dog is known to do! 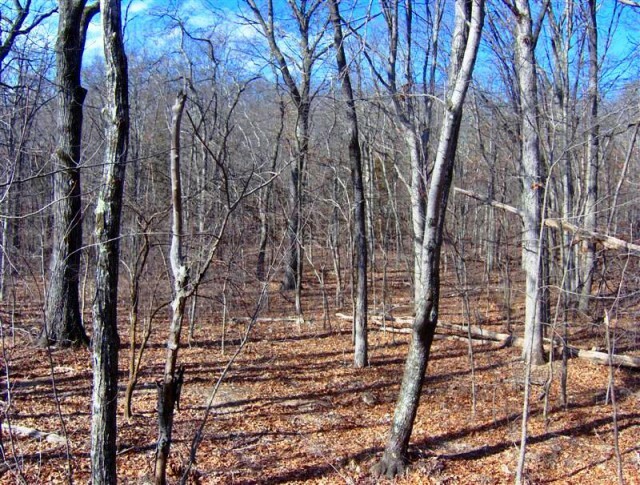 Located in the VERY HEART of MARK TWAIN NAT'L FOREST, these wooded 32+ ACRES adjoin USA land on the south line. Near Courtois Creek and Huzzah Creek at Red Bluff, there are thousands and thousands of acres of public forest land you are welcome to explore and enjoy! Only 6 miles to the nearby small town of Viburnum for shopping and church – and only 90 minutes from St. Louis County if you're looking for an accessible recreation/escape property. Inside, the home is well maintained with laminate floors. The bright cheerful country kitchen has two deep pantries and cute built-in storage hutch, and is furnished with newer appliances. Forced air furnace is assisted by COZY WOOD BURNING FIREPLACE and OUTDOOR WOOD FURNACE and WOOD STOVE IN THE BASEMENT! Bring all your critters, there's room for all on this happy hobby farm! SOLD SOLD SOLD! SOARING CATHEDRAL CEILINGS of tongue’n’groove pine, WOOD BURNING FIREPLACE with gorgeous 2-story NATIVE STONE CHIMNEY, HARDWOOD FLOORING and MASSIVE STAIR and BALCONY RAILINGS lend a rustic “Ponderosa” flavor to the open floor plan of this spacious home! Lots of windows and skylights make this home bright and inviting! 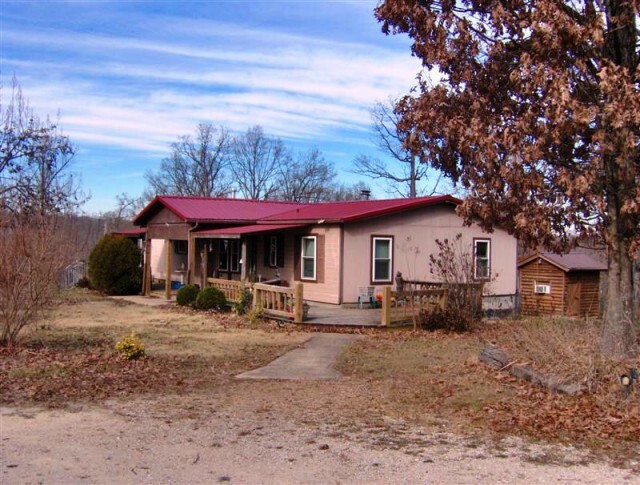 This nice home is VERY PRIVATELY SITUATED ON 10 FENCED ACRES, with three sides BORDERED BY MISSOURI CONSERVATION COMMISSION LAND (another 180+ acres of privacy and recreational opportunity surround you!) You’re going to enjoy the BEST of COUNTRY LIVING here, yet be only 8 miles on PAVED ROAD to a friendly COUNTY SEAT TOWN (WalMart awaits, as well as regional hospital and plenty of shopping ops)! Salem is the gateway to the precious Current River and Jack’s Fork Scenic Riverways (where the trout live) as well as the vast and beautiful Mark Twain National Forest – I see plenty of floating+fishing+camping+hiking+hunting+riding – 4 hooves or 4-wheel -- in your future! Step inside “Big Blue” – you’ll find a casual open floor plan on the MAIN LEVEL, where the MASTER BEDROOM has its own full bath (with jet tub and separate shower). The efficient KITCHEN features NICE deep double-door swing out pantry, and electric range in the island. The UTILITY / LAUNDRY ROOM offers generous workspace that connects to the ATTACHED GARAGE. The UPPER LEVEL features a COZY SITTING AREA on the landing outside two good-sized bedrooms connected by their Jack’n’Jill bath…….AND a BONUS ROOM that would be a great 4th BEDROOM, GUEST ROOM, or OFFICE SPACE. Nice woodwork throughout! Take in the lovely views of nature outside from the COVERED FRONT PORCH, large BACK DECK, and a SUN ROOM-ENTRY that your plants are sure to love! Of the 10 ACRES, approx. 6 acres are open in luscious grass -- with a small pond. A horse or two would be happy campers here and wildlife will be the only neighbors you see! SOLD SOLD SOLD! OVER THE RIVER and THROUGH THE WOODS – to GRANDMOTHER’S HOUSE WE GO! 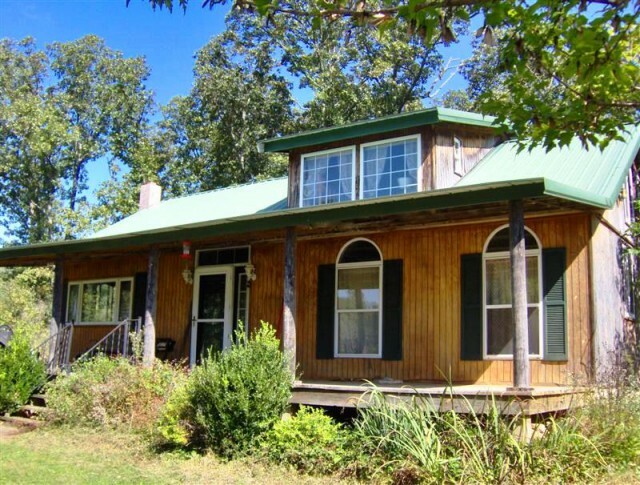 Granny's CLASSIC FARM HOUSE is tucked into a peaceful and oh-so-PRIVATE END-OF-THE-PRIVATE-ROAD valley setting in southern Crawford County. Less than 5 miles to town for all your basic needs, and two hours to DOWNTOWN St. Louis if you really want to go there – and 90 minutes to South County! It's so quiet out here folks, you can hear the birds singing harmony with the tune of the trickling SPRING BRANCH! 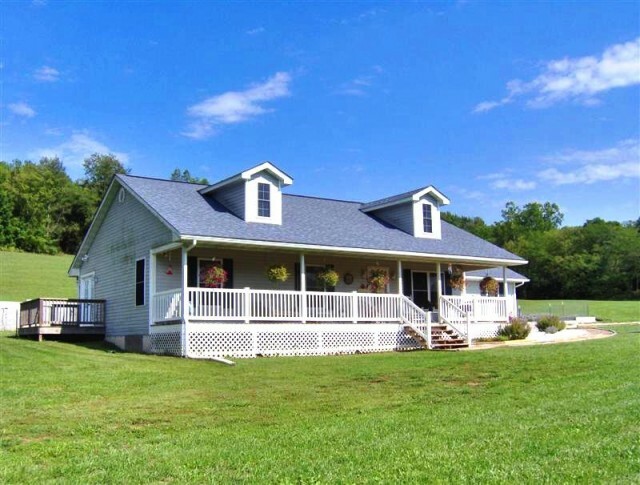 This luscious little HOBBY FARM is SURVEYED and FENCED, half PASTURE half WOODS, complete with CLASSIC 3-story BARN (might need a little fixin’), GOAT SHED, HEN HOUSE w/STORAGE SHED and a 2-car GARAGE! You could LIVE OFF THE LAND here with plenty of pasture for a HOBBY HERD and there's a fenced GARDEN SPACE! Abundant LIVE WATER –springs are popping up all over! The water source for your faucets is an ARTESIAN WELL. The big old house has plenty of room too! 3 LARGE BEDROOMS upstairs, WALK-IN CLOSETS and STORAGE SPACE GALORE! The main level features a BONUS BEDROOM (or office space) and a LARGE COUNTRY KITCHEN – and UTILITY ROOM, ROOT CELLAR, LAUNDRY ROOM, and MUD ROOM. The front SCREEN PORCH is the "perfect sleeper!" SAVE $$$ on utility bills with WHOLE HOUSE WOOD FURNACE. Are you craving a quiet weekend place (in the heart of Mark Twain Nat’l Forest's recreational possibilities). Are you ready to immerse yourself in a self-sustainable lifestyle? This luscious little HOBBY FARM offers the best of BOTH WORLDS! Historic home needs TLC & repair to bring it into the 21st century. While you give it the fixing it needs it will give you the satisfaction of owning a hidden gem of the Ozarks! Near HUZZAH and COURTOIS CREEKS and thousands upon thousands of acres MARK TWAIN NATIONAL FOREST land. Near STEELVILLE, RED BLUFF and PUCKY HUDDLE, and all the beautiful FLOATING and FISHING STREAMS!